Hi! 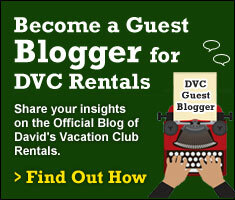 My name is Gail and I have worked for David’s Vacation Club Rentals since February 2013. It’s important for the staff here to be knowledgeable about the various resorts at Walt Disney World. Part of our training includes a “learning” trip so that we can speak from first hand experience about the amenities available at each resort. I thought you might like to hear about my trip and some of the things I learned. My trip was planned for June 17-21 with Cathy and Melissa. I was very excited about this trip as I had not been to Disney since 1993. Having listened to friends, family and our guests about all that was new and exciting at Walt Disney World, I already felt like I was a kid again just waiting for the day to arrive. I even fashioned a countdown calendar out of post-it notes and affixed it to my monitor. The three of us stayed at Saratoga Springs. 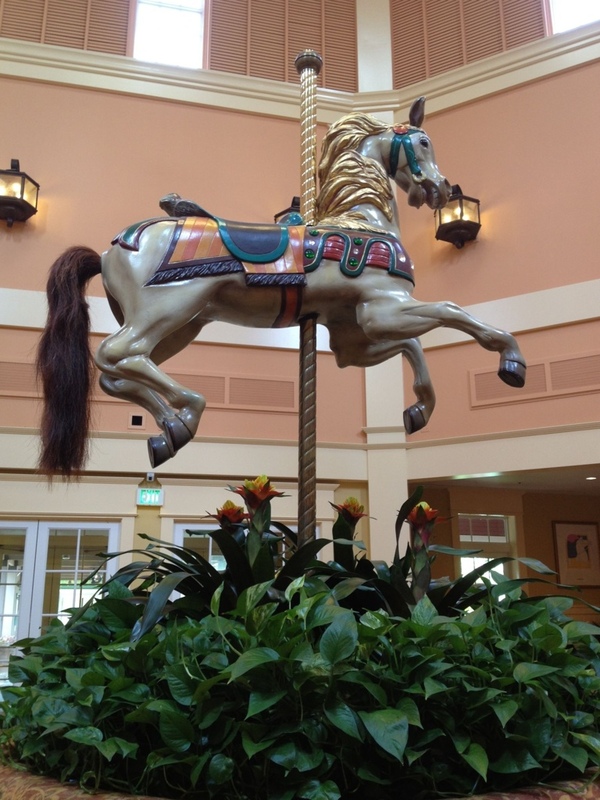 After checking in, where a full sized carousel horse greeted us in the lobby, we took a pleasant walking tour of the resort. 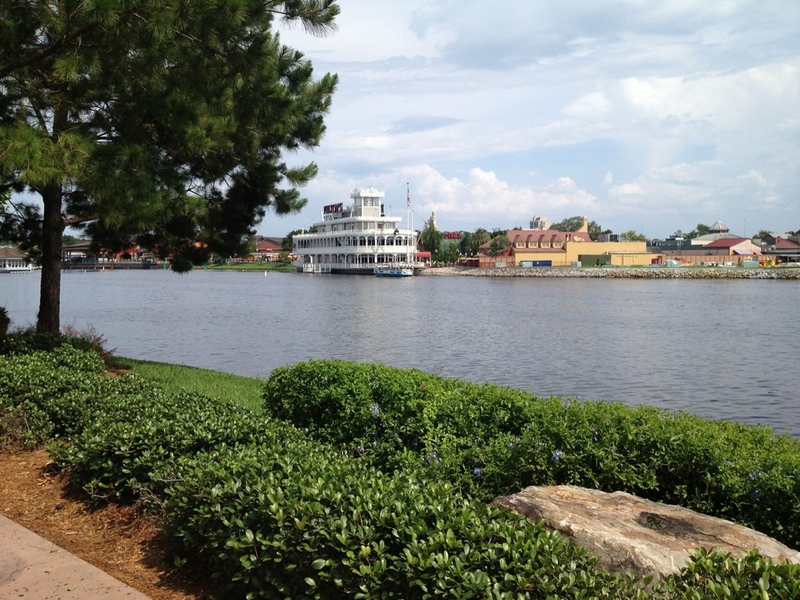 There are walkways throughout with a nice view of Downtown Disney. 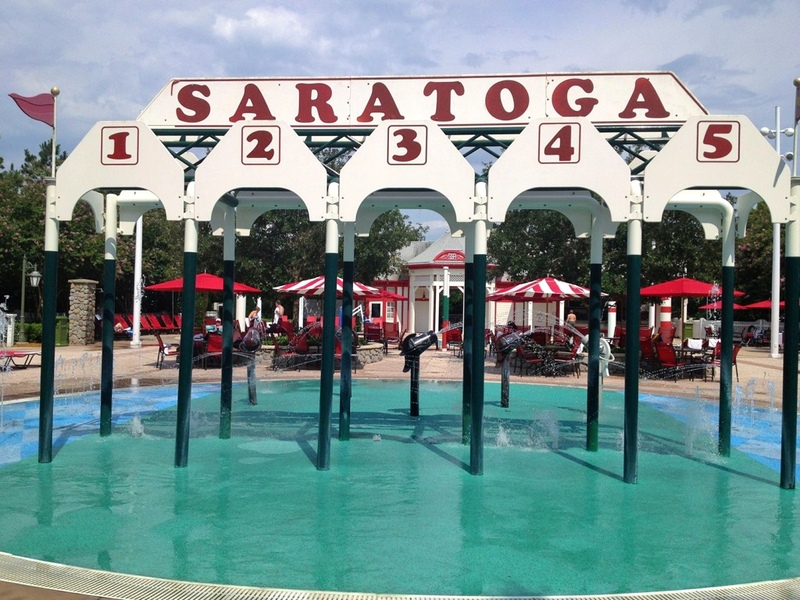 In the Grandstand section there is a zero entry pool and a splash pad fashioned to resemble a horse paddock for cooling off. 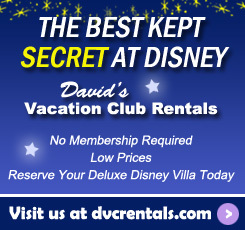 I loved visiting all the Disney Vacation Club resorts. I had seen them in photos, but experiencing them in person made me realize how much work and detail has gone into them all. 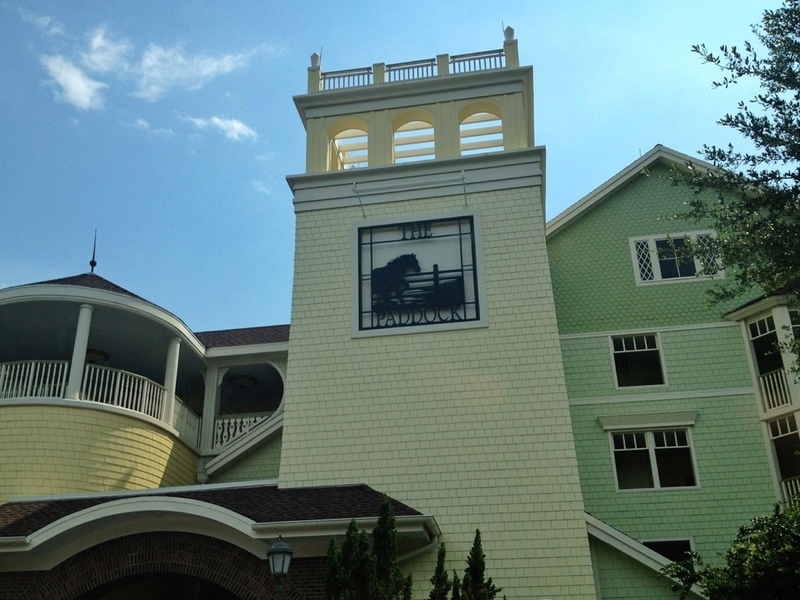 From Saratoga Springs, we jumped into the car and drove over to check out the Boardwalk and Beach Club resorts. 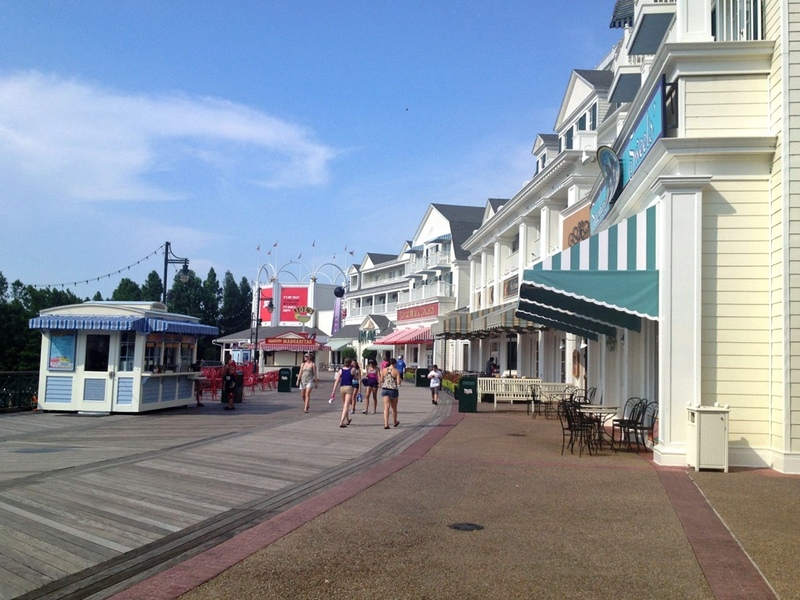 Boardwalk is so pretty with its bright red and blue buildings. As we walked along the boardwalk I made note of a merchandise shop, the Boardwalk Bakery, the ESPN Club for sports fans, and the Flying Fish Café, where we were having dinner later that night. The pale green and blue buildings of the Beach Club resort are just a short walk over the bridge from the Boardwalk resort. The lobby is filled with beach memorabilia, comfortable seating areas and lots of windows to take in the beautiful view. The sand bottom pool at Stormalong Bay was very busy. It has a little sandy beach area for the kids to play at. The hot tub, play area, lounge chairs and umbrellas make for a very inviting location. I see why so many of our guests request both these resorts. 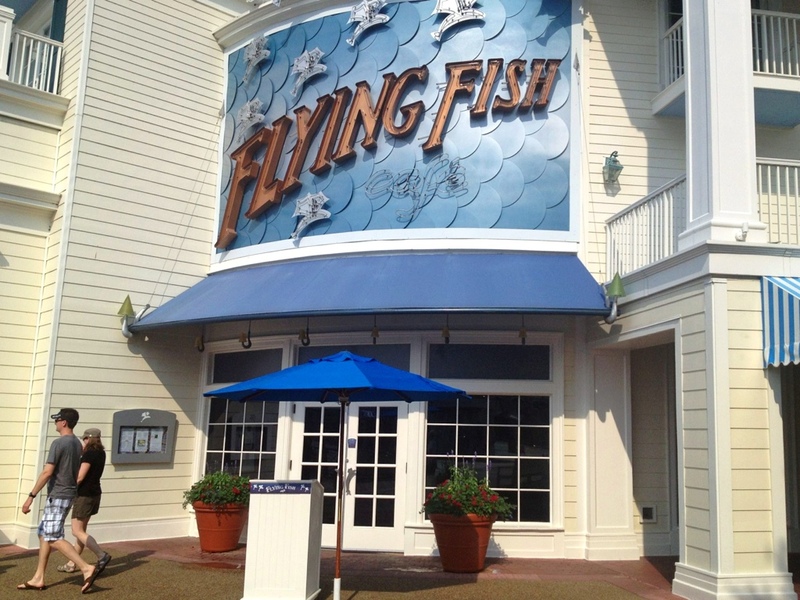 Flying Fish Café was a dining experience that I didn’t expect to have at Walt Disney World. Most times when I asked about the food everyone gushed about corn dogs, cupcakes and Mickey ice cream bars. The Flying Fish was fine dining at its best. Our waiter, Jr., made sure that we had a lovely quiet corner where we could enjoy our Key Lime Martinis. We were treated to an amuse bouche of raw salmon on a fancy coleslaw with a fantastic drizzle of balsamic glaze reduction. Quite honestly, raw fish is not usually my thing, but the chef had made it especially for us so I gave it a try. It was full of complimentary flavors and the salmon melted like butter in my mouth. For my entrée I tried the halibut and it was delicious. Cathy and Melissa both enjoyed their meals as well. We had some amazing desserts and coffee to round off the meal. I had the Blueberry Crème Brule. The service, food and atmosphere at Flying Fish were top notch and I would recommend it for anyone celebrating a special event. Tuesday started bright and early with a quick breakfast in our rooms, which was a good way to keep our food costs down. We were able to purchase our food at the general store located near the lobby. 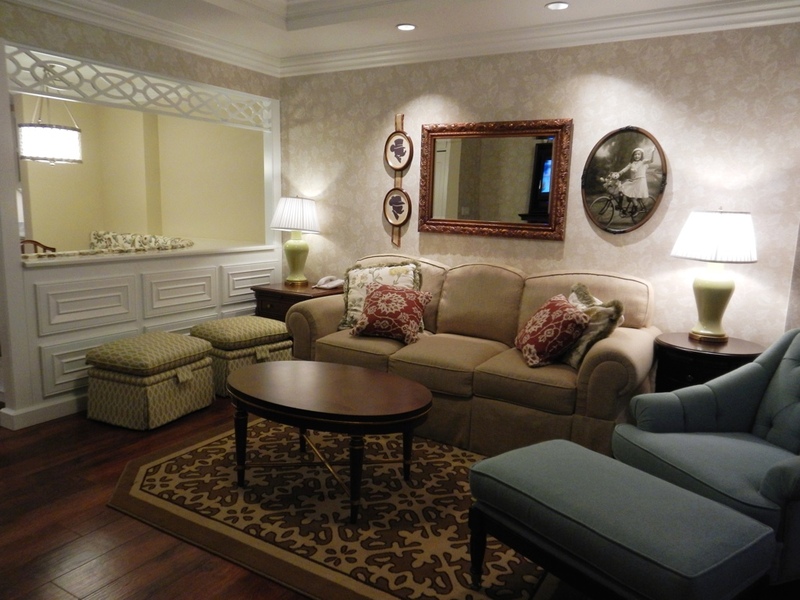 Then it was off to visit the Disney Vacation Club model suites located at Saratoga Springs. There are models of studios and one bedrooms from Animal Kingdom, Aulani and the Grand Floridian. 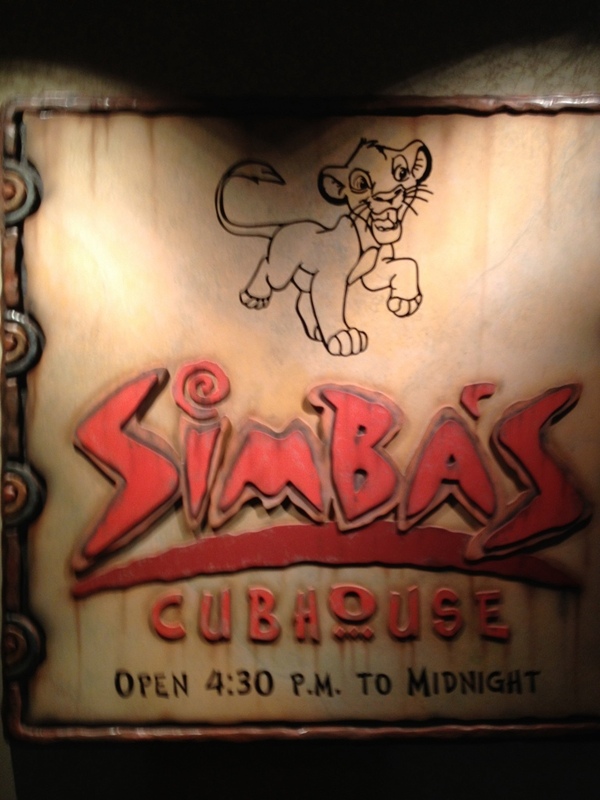 The Animal Kingdom rooms are decorated in dark woods. 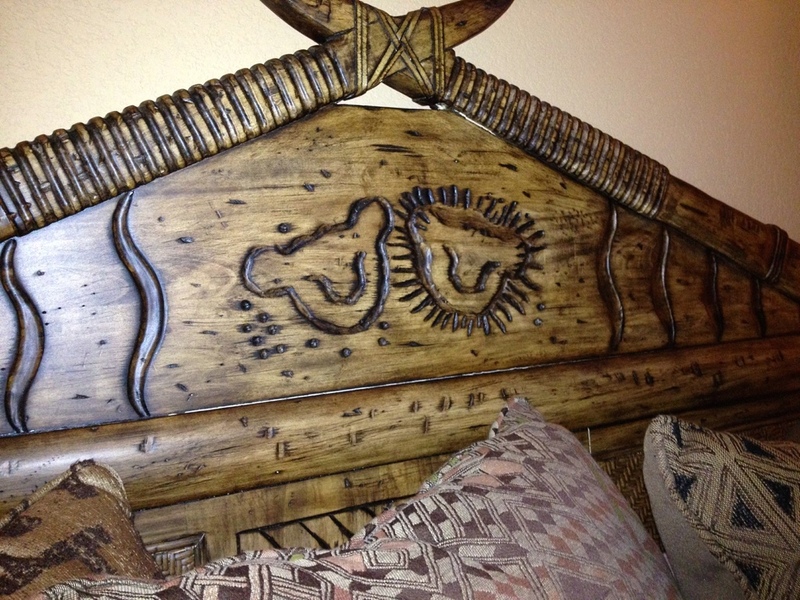 In the center of the headboard the carved lions looked like hidden Mickeys to me. The Aulani suite honestly felt like we were in Hawaii. 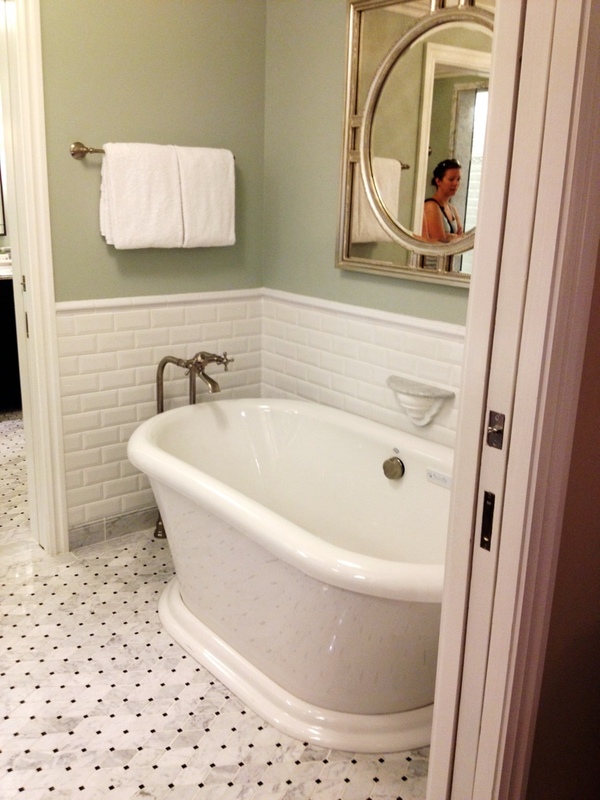 It had a very beach-like feel, complete with white shutters and a TV screen embedded in the bathroom mirror. Unfortunately, I don’t have a photo to share from this suite. I do have some from the Grand Floridan model however, which was breathtaking. The ceiling is all finished with crown molding. The fifth person’s sleeping area in the studio is a small trundle bed that pulls down from the TV center. 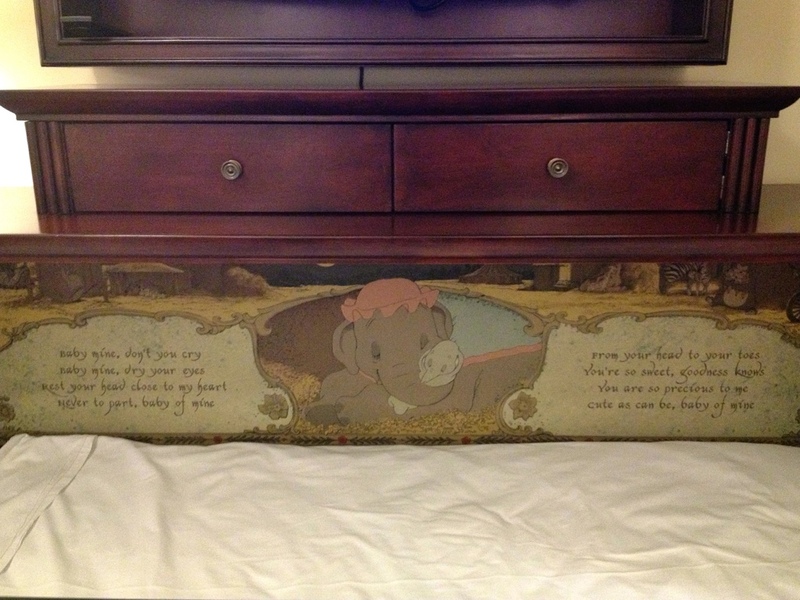 A mural of Dumbo and a little saying complete this very cute little bed that I am sure any child would like. There is a bubble tub in the bathroom, which also has a TV screen in the mirror. It even comes with a waterproof remote. They really thought of everything! 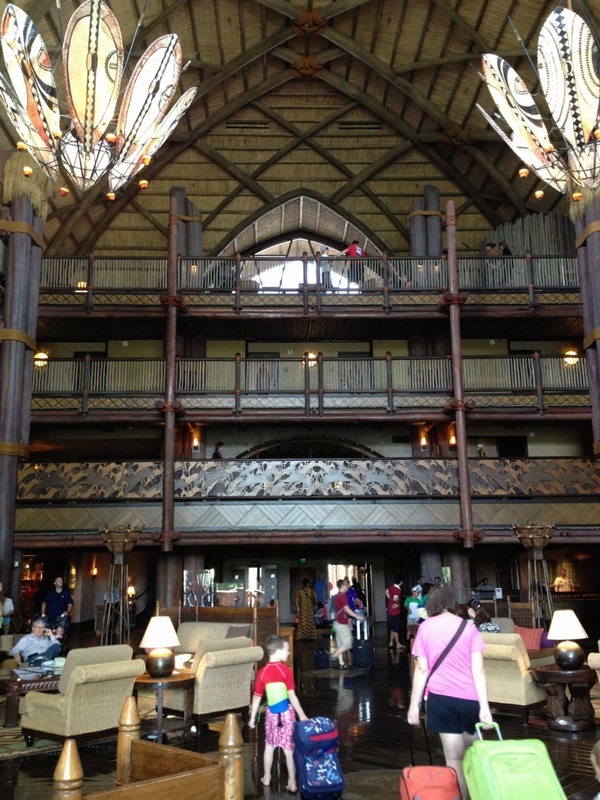 After viewing the model suites, we decided to visit Disney’s Animal Kingdom Lodge resort. This was my favorite resort! The Jambo House (main building) lobby made me feel like I was actually in Africa. The animals on the savannas were amazing. There was a larger than expected variety of animals on the savanna that day. Very knowledgeable Disney Cast Members were assisting guests with any questions that they had about the animals or savanna. Most of these Cast Members were from South Africa or Australia. I learned that the art collection at the resort is the second largest of its kind in the world. 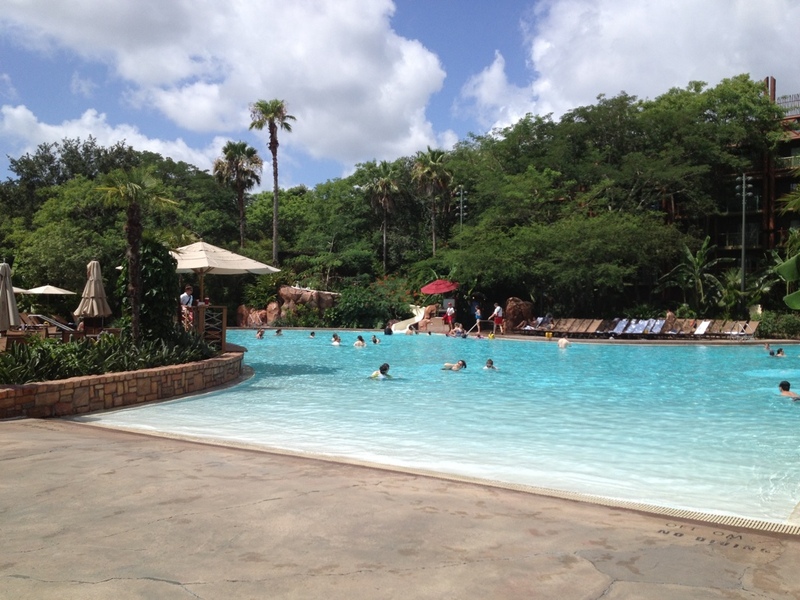 At Jambo House there is a huge pool, complete with slides, and a splash pad area. There is also an activity room for crafts and story time for the kids and a fitness center for the adults. The lobby of Kidani Village (where most of the DVC rooms are) is more intimate than Jambo House and is decorated in the same beautiful African theme. There is a smaller pool there and a fantastic water play area for children. 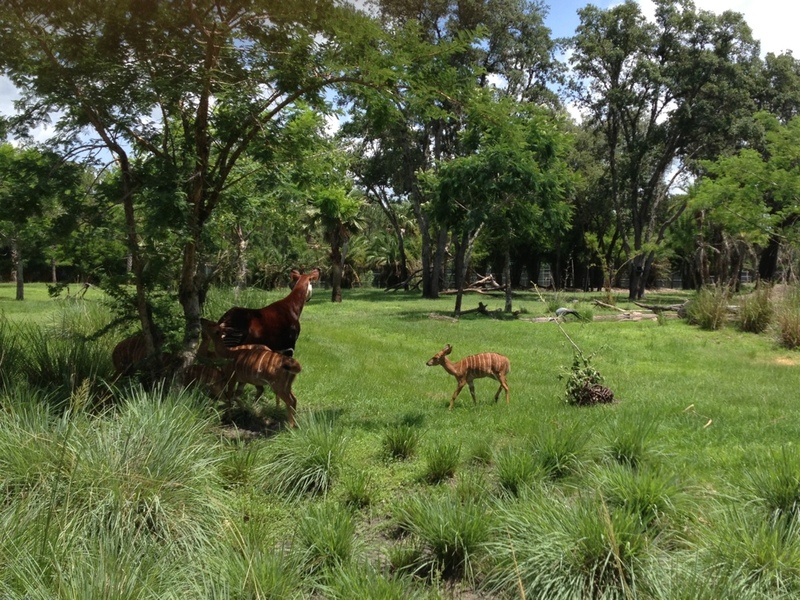 Guests can use all amenities at both Jambo House and Kidani Village and there is a shuttle that runs between the two sides of the resort. 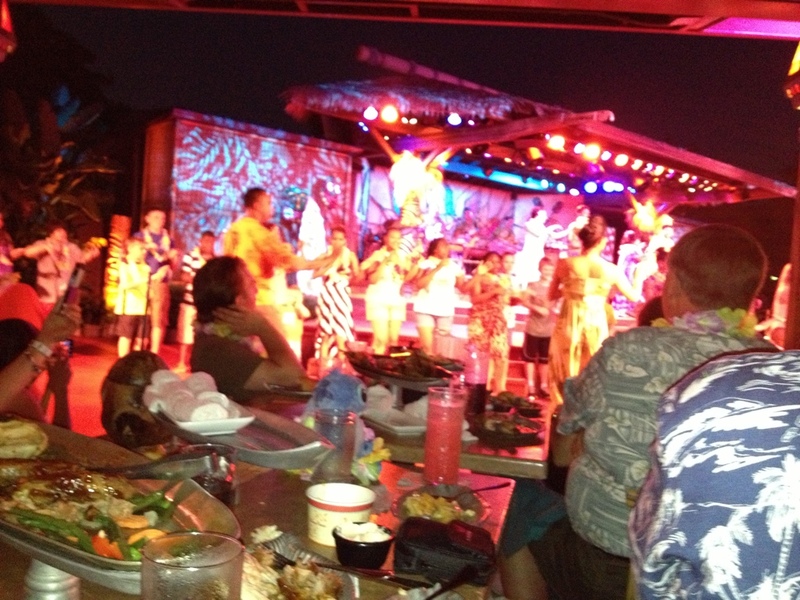 For dinner on this day we took in the Spirit of Aloha luau at the Polynesian resort. The Polynesian has a beautiful lobby filled with plants and flowers. 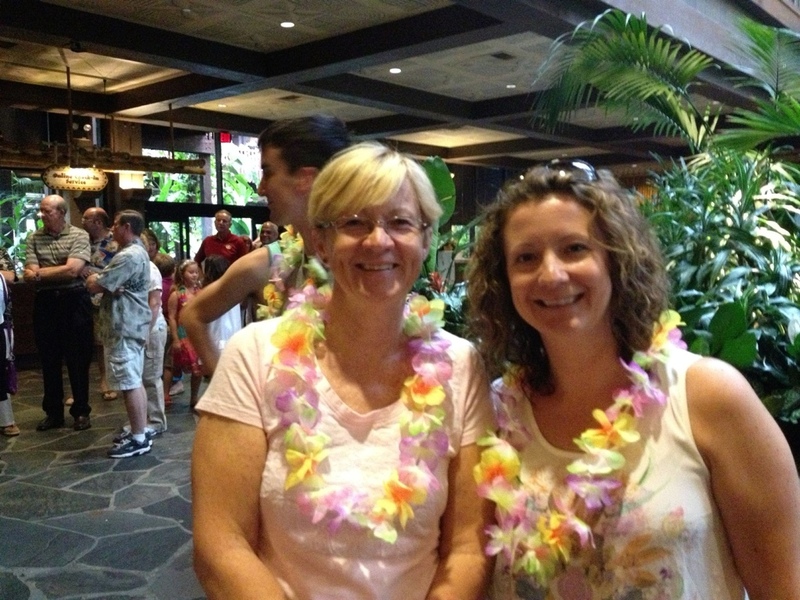 We were each given a lei and had our picture taken. Then we walked through the resort to a secluded area for our dinner. We arrived at our table and the appetizer course was served. There was a nice variety of items but we could have used a second helping as we were starving from our busy day. The main course followed and included pulled pork, ribs and chicken. 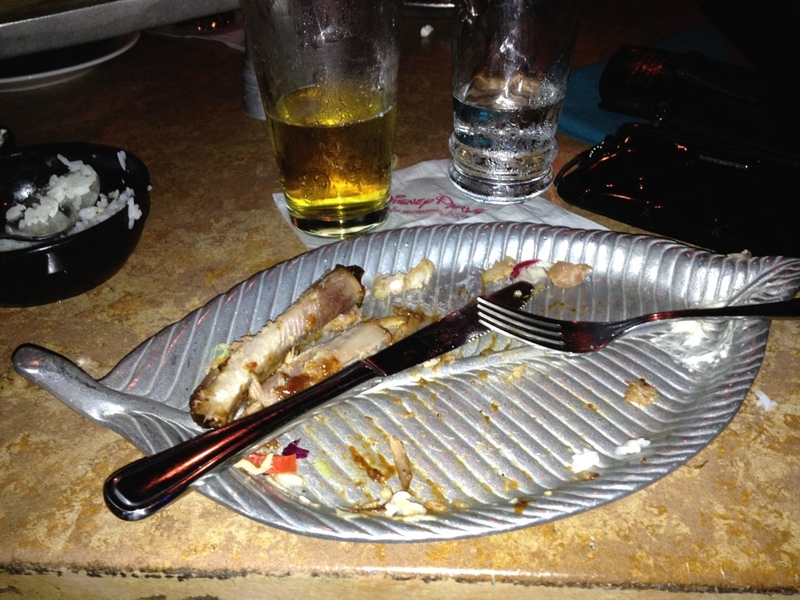 As you can see, we enjoyed our meal. The dinner show was very well done. The dancers, band and MC kept us entertained. The fire display at the end was the best! As we were returning to the car after the show, we stopped at the beach area to catch some of the fireworks from “Wishes” at the Magic Kingdom. 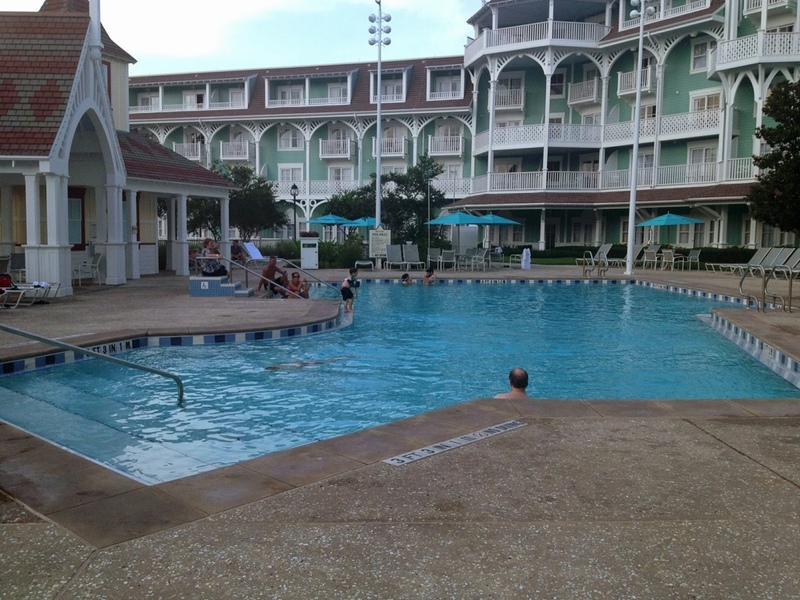 Then upon returning to our villas at Saratoga Springs, I took advantage of the warm evening with a short walk to the pool for a swim. The water was warm and refreshing and there were guests taking advantage of the barbecue in the area for a late dinner. It was a lovely way to cap off a wonderful day. Be sure to come back on Monday for Part 2 of my trip when I’ll take you with me to see the Magic Kingdom resorts and to have some fun in the theme parks.